Generally seen as a sign of weakness, failures are often swept under the rug. It’s one thing when it’s the other guy’s problem, but no one’s laughing when it happens to them. 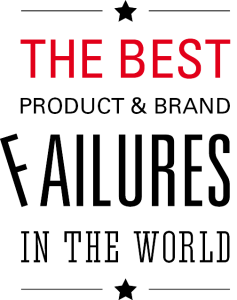 The Best Product & Brand Failures in the World is a stimulating, entertaining and thought-provoking talk presented jointly by Jevto Dedijer and Michel Nadeau, two experts in brand strategy and… in business failures. Stiff competition? Fast-changing markets? Failures often stem from factors inside the company: poor positioning, lack of vision, improvisation or faulty strategy. Close to home or halfway around the world, classic cases or recent reports, all failures have lessons to teach us, lessons that are better not learned the hard way. Here’s your chance to look on the bright side of failure. Length of the conference: 60-90 min. "A really interesting talk that showed us that sometimes you have to make mistakes in order to get ahead." "Failwatching shows you how failure can lead to success." "Here is an original, fresh and even upbeat look at failure." "This talk that made us realize that even the best and brightest sometimes have bad ideas. The importance is to learn from your mistakes." Trust us, we’re serious but never stuffy.